ALTO ARX is the physical representation of what #HappyArchiving is about. It takes only power and network connection to make your data safe for a century or lifetime. ALTO ARX is designed for the task of easiest start of real and secure archiving, followed by years and years of smooth work. No matter if you are a media man, law firm, security expert, scientist or a healthcare specialist, ALTO ARX will change your archival experience for ever. Total security with 2 copies always created, connectivity via all IT standards over Ethernet, and low-power green operation saving 99.5% of electricity, as we turn the disks on only when you access the data, delivers unmatched price, performance, security and longevity. ALTO ARX is Compact High Density Data Archival Storage with 100TB (or 50TB upgradeable to 100TB later) of totally secure, dual-copy of digital storage in 4RU ALTO ARX Chassis with 22"/56cm length. It is highly secure with automatic preconfigured dual data copy via replication. Such design allows avoiding data vulnerabilities during other systems lengthy RAID rebuilds. ARX uses 30-days-test-run disks to eliminate so called "infant disk mortality" for smooth start of archiving. Our spin-down approach allows on the other side century long lifetime, and avoids forced EOL replacement cost. ALTO ARX is fully compatible with other ALTO systems, allowing de facto infinite archive when your needs grow. ALTO ARX is best starting point to build scalable and flexible solution for content libraries, enterprise archive and work groups. It provides a distributed systems with high availability, and can be configured in business continuity configurations. It can be configured to work in hybrid way with our Archive as a Service offering, to provide disaster-secure archive. ALTO ARX enables the removal of disks from the ALTO chassis for media transportation, local media access, and vault storage. A disk removed from any ALTO will be recognized by any other ALTO and a disk can be opened independently with any standard computer (if you know the password :-). Power Saving - Archived media tend to be infrequently accessed so the system media re turned off, providing that it can be brought tro full speed in below 30s for reading or writing. ALTO uses this principle in a unique storage architecture in which each independently controlled disk can be spun-down when not being accessed for reading or writing. This unique blend results in significantly lower power consumption per Terabyte than any other digital storage, with the random access benefits of disk storage. Low power consumption and related tiny waste heat created result in outstanding environmental credentials. 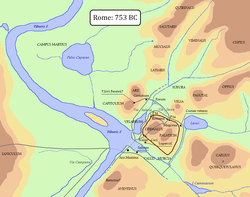 The location of the Arx is indicated on this speculative map of Rome circa 753 BC. Arx is a Latin word meaning "citadel". In the ancient city of Rome, the arx was located on the northern spur of the Capitoline Hill, and is sometimes specified as the Arx Capitolina. At Rome, sentries were traditionally posted on the Arx to watch for signals displayed on the Janiculum if an enemy approached. A red flag would be raised and a trumpet blown. The Arx was not regularly garrisoned, however, and should not be regarded as a "fort." However, in the Gallic siege of Rome (387 BC), the Arx was considered the point of last retreat, the capture of which was synonymous with the capture of the city. It thus held a symbolic power beyond its importance in military strategy, and was a central place in archaic Roman religion. During the regal period, some members of the elite were permitted to live on the Arx, among them the legendary Sabine leader Titus Tatius. After 384 BC, the Senate banned all private dwellings from the Capitoline Hill, including the Arx. The house of Marcus Manlius Capitolinus, a patrician champion of the plebs who was convicted of seeking kingship, was torn down at this time and later became the site of the Temple of Juno Moneta. On the Arx was located the auguraculum, the open space where the augurs conducted the rituals that determined whether the gods approved of whatever undertaking was at hand, public business or military action. This auguraculum was the stone where the elected monarch, during the Roman Kingdom, was seated by the augurs with his face to the south. Major temples on the Arx include that of Juno Moneta (established 344 BC), where the mint was located; Concordia (217 BC); Honor and Virtue; and Vediovis. Jupiter, however, was the god of the Arx.